The year 1836 is as important to Texans as the year 1066 is to the English. However rather than celebrating the conquering of their nation, Texans celebrate becoming independent from Mexico. The most significant battle for this independence was fought at the San Antonio de Valero Mission, now known as the Alamo. What was the (roofless) church of the mission at the time is now a shrine to the 32 people who lost their lives fighting for an independent Texas in February 1836. Although the Mexican army overcame the defenders of the Alamo after a 13 day siege, Sam Houston’s subsequent defeat of General Antonio Lopez de Santa Anna at the Buffalo Bayou heralded the birth of the Republic of Texas in March of the same year. Texas remained a Republic until 1845 when it joined the United States as the 28th State. Photography is not allowed inside the shrine, so here’s the commonly seen outside of the Alamo. They also re-enact the battle of Villita. I felt most sorry for the guy playing the wounded soldier – it was a cold day and he was lying on the cold stone ground for quite some time. He moved occasionally so I’m quite confident it was a person rather than doll! 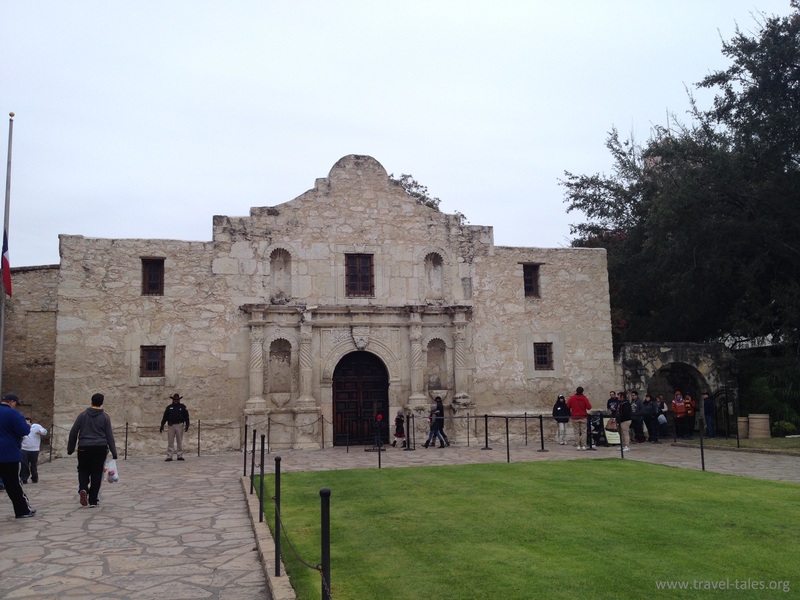 I remember the John Wayne film, The Alamo, where the mission was way out of town. I was in some ways disappointed in 1965, to find I could walk to it from the San Antonio Greyhound Bus Station. I had expected to have to take a taxi out into the country districts.